If you are in the market for a 7-passenger, three-row crossover SUV, making a Chevy Traverse vs. Ford Explorer comparison is worth examining. In 2011, these two models became true competitors as Ford transitioned the Explorer into a body-on-frame SUV built on a car-based platform from the Ford Taurus sedan. The Explorer was previously built on a truck-based platform, shared with the Ford Ranger pickup. The Chevy Traverse first debuted in the 2009 model year as Chevy built up its crossover lineup. It largely replaced the Trail Blazer midsize SUV. The 2011 Traverse comes with just one engine choice, a 3.6-liter 281 horsepower V6 engine. The Traverse incorporates design themes from the Chevy Malibu. 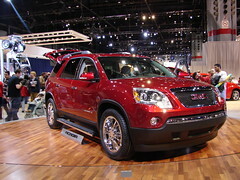 Its platform is shared with other GM crossovers: the GMC Acadia and Buick Enclave. With a standard-six speed automatic transmission, the Traverse gets decent fuel economy for such a large vehicle. It is rated at 17-mpg city and 24-mpg highway in front wheel drive (FWD) form and 16/23 with AWD. 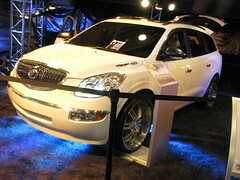 The 2011 Traverse is offered in four true trim lines with each trim having an FWD and AWD version. The entry level 2011 Traverse LS FWD has an MSRP of $29,370. It comes standard with power door locks, power windows, air conditioning, and CD player. On the other end, the Traverse LTZ AWD has an MSRP of $40,250. It adds leather seats and power seats, as standard features, but a sunroof and navigation system remain optional. The 2011 Explorer offers a 3.5-liter 290 horsepower V6 engine. It has been warmly received winning in the truck category as best new model at the North American International Auto Show. Some consider it the best midsize SUV but it has many worthy, if not superior competitors, depending on your needs. The Explorer has similar towing capability, pricing, and fuel economy compared to the Traverse. In terms of acceleration, according to Motor Trend the Explorer Limited AWD has a 0-60 time of 7.8 seconds while the Traverse LTZ AWD has a 0-60 tine of 7.7 seconds. Both of these models have a host of great standard safety features such as ABS, traction control, electronic stability control, and driver, passenger, and side airbags. Both the Traverse and the Explorer were named “Top Safety Picks” by the Insurance Institute for Highway Safety, making them among the safest 2011 SUVs. Where the Traverse really shines over Explorer is in interior space. The Traverse claims seating for eight and seats seven comfortably. It has a cargo volume of 116.4 cubic feet, which is near minivan-like. The Traverse’s cargo volume is nearly 1.5 times as big as the Explorer. Making a Ford Explorer vs. Chevy Traverse comparison can help you determine which of these vehicles is a better fit for your needs. Competitors to these models include the Honda Pilot, Toyota Highlander, Mazda CX-9, Dodge Durango, and Hyundai Veracruz.